You can have a pair of breeches made to your exact specifications, i.e size, colour and fabric. These breeches have a fall front with button fastening to the waist, fall and calf. A Regency gentleman's pair of breeches. Opening paragraph ~ Pride & Prejudice ~ 1813 ~ Jane Austen. This lovely Regency dress is ideal for dancing, walking, Regency picnics, et al. It is created from a beautiful floral cotton of Wedgewood Blue & Lilac on an Ivory background. A Georgian / Regency Style gentleman's pair of breeches, in dark beige cotton sateen fabric. ( washable on a cool wash.). They have a 'fall' front fastening and secure with gold -coloured buttons. The breeches are fully lined in cotton fabric. Here I have for auction is a Reproduction Regency gown. 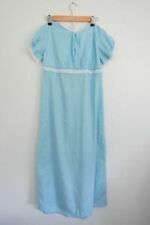 This is another gown that I made for my daughter many years ago but it is a very petite size 6 I have attached a photo of my daughter wearing this gown so you can see how it looks when dressed. All handmade with a wrap and bag so you can hide your mobile. Length is for a 5 foot ins tall This was made using a cream taffeta underlings with a cream voile fabric. Pearl buttons on the back section. Any questions please message me. Thank you for looking. New listingGeorgian/ Regency Jabot Shirt. A black 100% felted wool tricorn hat with black trim. to fit head circumference 22” we can make you a tricorn to your exact specifications, just drop us a line. Please check out Mrs Papendick on Facebook. We can make you your Georgian or Regency outfit ( men and women) to your exact specifications. Pleased check out out seller feedback to confirm that you would be purchasing a high quality item at a realistic price! Any questions please do not hesitate to message us. A black 100% felted wool tricorn hat with red trim and red and black cockade. to fit head circumference 23” we can make you a tricorn to your exact specifications, just drop us a line. Please check out Mrs Papendick on Facebook. We can make you your Georgian or Regency outfit ( men and women) to your exact specifications. Pleased check out out seller feedback to confirm that you would be purchasing a high quality item at a realistic price! Any questions please do not hesitate to message us. 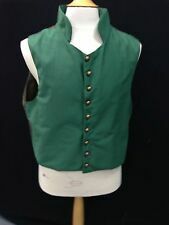 Blue Spencer Jacket | Regency | Empire Line | Costume | Fancy Dress. Condition is Used. Dispatched with Royal Mail 2nd Class. New listingRegency, Jane Austen Inspired, Chemisette in Muslin With Ruffle Collar. Regency Style Home-made White Cotton Chemisette. The chemisette is a size medium (size 14) made using a Sense & Sensibility pattern. The chemisette is secured by a small mother of pearl button at the neck and ribbon ties under the bust. The main fabric is 100% cotton and I suspect the broderie Anglaise is polycotton as there is a slight difference in the colour of the two fabrics. Comes from a pet free and smoke free home. Please note I use recycled packaging to save the environment. A Georgian / Regency Style gentleman's pair of breeches, in dark beige cotton sateen fabric. ( washable on a cool wash.) They have a 'fall' front fastening and secure with gold -coloured buttons. The breeches are fully lined in cotton fabric . The breeches cinch in at the back around 2” with lacing. Measurements - please note these are ACTUAL measurements not the same thing as shop measurements! 34” waist - before cinching. 14" inside leg length 14" calf 22" thigh Not your size? You can have a pair if breeches made to your exact specifications, i.e size, colour and fabric. Just drop us a line. Please look at my other listings for further Regency inspired items or you can check out Mrs Papendick, Historical Seamstress on our site. A black 100% felted wool tricorn hat with ivory trim. to fit head circumference 22” we can make you a tricorn to your exact specifications, just drop us a line. Please check out Mrs Papendick on Facebook. We can make you your Georgian or Regency outfit ( men and women) to your exact specifications. Pleased check out out seller feedback to confirm that you would be purchasing a high quality item at a realistic price! Any questions please do not hesitate to message us. A velvet ribbon Regency gentleman’s plain fob with long tassel. Lobster claw clasp in brass to attach to watch. Please check out Mrs Papendick on Facebook. We can make you your Georgian or Regency outfit ( men and women) to your exact specifications. Pleased check out out seller feedback to confirm that you would be purchasing a high quality item at a realistic price! Any questions please do not hesitate to message us. A velvet ribbon Regency gentleman’s plain fob with brass charm. Lobster claw clasp in brass to attach to watch. Please check out Mrs Papendick on Facebook. We can make you your Georgian or Regency outfit ( men and women) to your exact specifications. Pleased check out out seller feedback to confirm that you would be purchasing a high quality item at a realistic price! Any questions please do not hesitate to message us. Thick white in nylon and spandex ( I know not hand-knitted silk, but they will actually stay up and wash in a machine!). Very velvety feel. For sale beautifully handmade ladies Cadbury purple deluxe 19th Century Jane Austen 'Pride and Prejudice' style gown perfect for a Regency Ball or event. This dainty and beautifully romantic femine ball gown is created from a high quality soft duchess satin fabric with black lace around sleeves and an embroidered pattern around neckline and bottom of hem. For sale beautifully handmade ladies burgundy deluxe 19th Century Jane Austen 'Pride and Prejudice' style gown. This dainty and beautifully romantic femine ball gown is created from a high quality faux dupion fabric. Regency Long Sleeved Gown Made To Order In Your Precise Size. The gown will have long sleeves and fasten with buttons down the back and the skirt will NOT have a train. Unless you let us know differently of course. We will send you a wide range of photos of fabrics to choose from. A Regency style Gentleman's waistcoat in red brocade with flying mallard design 🦆 with stand up collar. It fastens with red dyed real shell buttons. For sale beautifully handmade ladies burgundy two tone deluxe 19th Century Jane Austen 'Pride and Prejudice' style gown. This dainty and beautifully romantic femine ball gown is created from a high quality taffeta fabric.